My New Book - as a printed book and eBook. The purpose of this Blog is to educate and entertain. Jerry X Shea shall have neither liability nor responsibility to any person or entity with respect to any loss or damage caused, or alleged to be caused, directly or indirectly, by the information contained on this Blog. 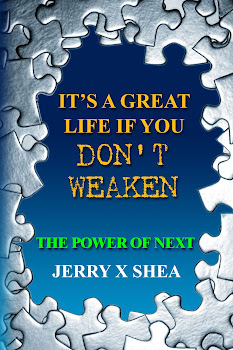 It is with the understanding that Jerry X Shea in not engaged in rendering legal, accounting or financial advice. Laws and practices often vary from state to state and if legal advice or other expert assistance is required, the services of a competent professional person should be sought. The information on this Blog is factually accurate, except that, in some cases, the names, locales, and individual traits have been fictionalized to preserve coherence while protecting privacy. Copyright © 2011 and all years to 2017 by Jerry X Shea. Awesome Inc. theme. Theme images by mammuth. Powered by Blogger.